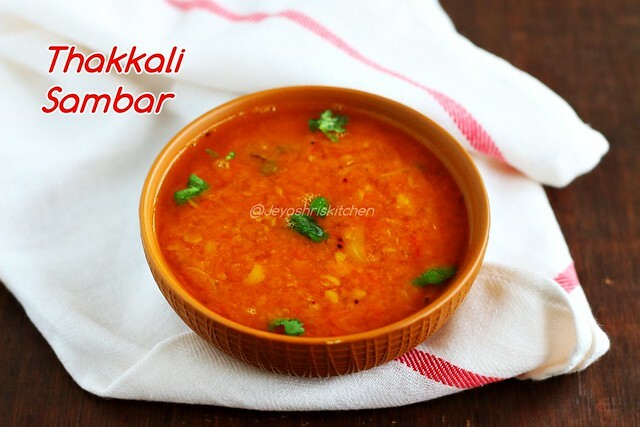 Thakkali sambar | Tomato sambar is an easy sambar recipe, generally made as a side dish for idli | dosa | Ven pongal. My grandmother makes thakkali sambar whenever she runs out of veggies in the kitchen. That she makes in the same way as we make drumstick sambar. This tiffin sambar recipe i followed the method which our neighbour aunty in Madurai used to make. As i got a huge pack of super ripe tomatoes from little India, i thought i will make this easy tomato sambar. I have made a video of tomato sambar too. Try this at home and let me know how it turned out. Chop the tomatoes and cook them along with toor dal and turmeric powder in a pressure cooker till 5-6 whistles. Once it is cooked mash it well. I used the traditional mathu/whisk for this. Soak the tamarind in hot water for 10 minutes and take tamarind extract using 1 cup of water. In a saucepan add the cooked toor dal mixture and the tamarind water. Add the sambar powder, asafoetida, salt and curry leaves. Switch on the stove and let this boil for 10 minutes in a medium flame. Stir this in between. If you feel it is thick add little more water. Do not worry if it is thin it will be perfect once it is boiled. Once done switch off the flame. Add coriander leaves. In a pan add oil, mustard seeds, slit green chili and sliced onions. Adding sliced onions is optional but it adds a nice flavour to the sambar. Once the onions are slightly brown add it to the sambar. Flavourful tomato sambar is ready. This goes well with idli, dosa and especially with ven pongal. Traditionally we boil the tamarind water first and add the sambar powder and allow this to boil and then in the last we add toor dal. You can follow the same method too. You can cook few small onions while cooking the toor dal, as we do in hotel sambar. 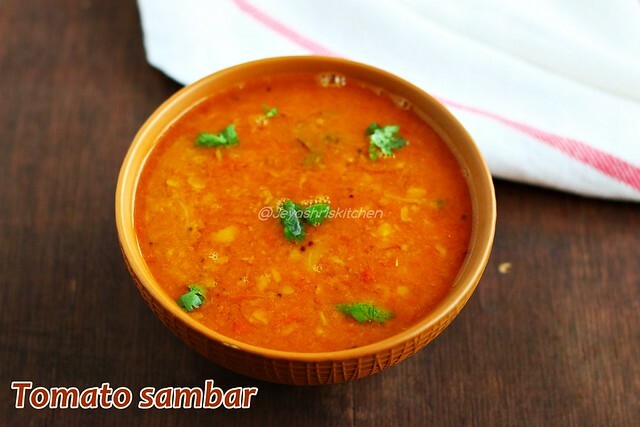 This easy tomato sambar tasted well with ven pongal. Thank you so much. Do try and let me know.